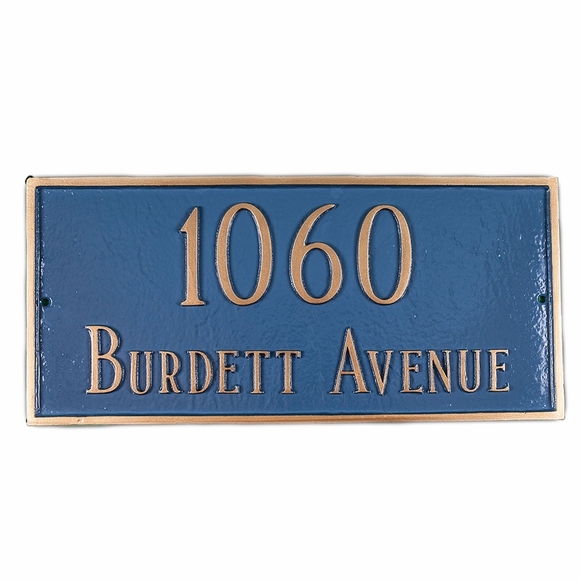 Wall Mount Address Sign - - personalized rectangle sign comes in three sizes: standard, large, and estate. Wall mount. Made in USA. Decorative rectangle displays a bold two-line address without any distractions. The thin border matches the color of your personalization. Three sizes: standard, large, estate. Standard size can be set up as a one-line or two-line sign. On a one-line sign, Line 1 holds up to five (5) 4" numbers. On a two-line sign, Line 1 holds five (5) 3" numbers and Line 2 holds up to seventeen (17) characters. Dimensions: 15.75"W x 7.25"H.
Large size can be set up as a one-line or two-line sign. On a one-line sign, Line 1 holds up to five (5) 6" numbers. On a two-line sign, Line 1 holds five (5) 4" numbers and Line 2 holds up to fifteen (15) characters. Dimensions: 21"W x 10"H.
Estate size also can be set up as a one-line or two-line sign. On a one-line sign, Line 1 holds up to five (5) 8" numbers. On a two-line sign, Line 1 holds five (5) 5" numbers and Line 2 holds up to seventeen (17) 2" characters. Dimensions: 28"W x 16.5"H.
Personalized rectangle wall mount address sign. Three sizes: standard, large, and estate. Made in USA.